www.mib-lights.com. Be sure to visit the site for all Phoenix Imaging, Ltd. related products and published articles. Phoenix Imaging offers a wide range of Manual Inspection Booths (MIB's). Some products are designed as Bench Top (sometimes referred to as Tabletop Units) when laboratory space is limited but counter top space is available. Other products are designed as Floor Standing Models, these have a large uniform inspection volume and are well suited for the inspection of all container shapes and sizes. Each models offers a different set of optional equipment but all are designed with feedback lamp control for very stable light intensity. The diagram below will help you to narrow down the type of manual inspection booth that will best meet your requirements. The Gray Boxes indicate Top Lighting Only, the Green Boxes indicate Dual Side Lighting, the Blue Boxes indicate Top / Bottom Lighting and the Yellow/Blue indicate Top / Bottom with LED Lighting. The Bench Top Models offer excellent light intensity control in a small package. These are ideal of Research and QA Labs where the light intensity is critical for consistent grading or product. Several models are available, with the lowest cost unit being the MIB-40. 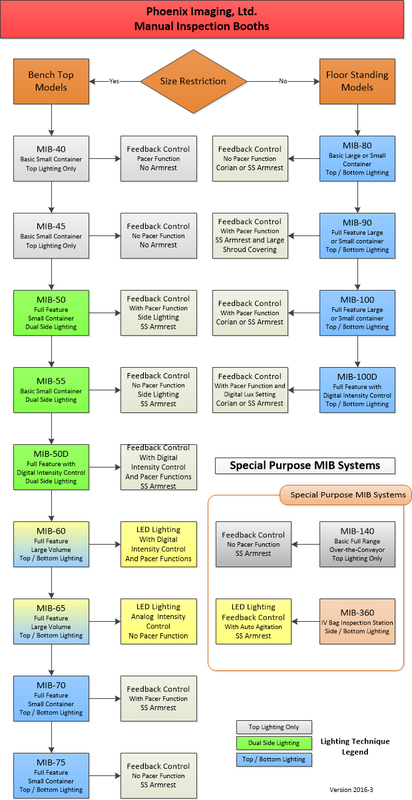 This MIB-40 is cost competitive with similar "Top Lighting Only" units, but offer the unique Phoenix Imaging MIB-2020 lamp controller for precise control of the lamps. The MIB-50 and MIB-55 offer the patented Parallel Lighting Technique in a Bench Top configuration. The MIB-50 and MIB-50 use a Dual Side Lighting method to increase the uniform inspection volume. All of the MIB Bench Top units provide an Master Intensity Control that allows the customer to set and hold the light intensity of the booth from 2000 Lux to 6000 Lux (some models can achieve higher intensity than others). The Floor Standing Models are designed for the inspection of all containers size, from 1 ml cartridges (and syringes) to the 1000 ml vials. The lighting technique employed in the MIB-80™, MIB-90™ and MIB-100™ uses the patented parallel illumination technique to provide up to 10 Liters of uniform inspection volume. The MIB-90™ and MIB-100™ are now available with the "D" option, this is a unique digital control that allows the user to change the light intensity of the inspection volume simply by entering the desired value on the operator interface. Most MIB units equipment with the Pacer PLC can also order the "LC" option that incorporates light curtains in front of the White and Black backgrounds to initiate the Pacer timer countdown function. This insures that the inspection is performed as specified in the departments operating procedure. All MIB units can be configured with a wide selection of options to meet customer requirements. There are several Special Configuration systems designed for use in the manufacturing environment. The MIB-140 is a top lighting design and provides precision light intensity control. The MIB-140™ is a top lighting unit designed to fit over existing conveyors. The height of the inspection booth (inspection hood) can be adjusted to fit more conveyors and only requires a low power connection in either 110VAC of 220VAC. The MIB-360™ is designed specifically for the inspection of IV Bags. The IV Bag is placed on a scatter proof glass plate on the inspection table. The White and Black back grounds are positioned below the IV Bag. The table top of the MIB-360™ will gently roll back and forth to agitate the IV Bag contents and allows the inspector to view the contents from a stationary position. If you have questions or need advice on the selection of the proper MIB lighting system please contact our office at 734-744-9280.